Ever since i have been little i have suffered from redness on my cheeks.When you’re younger everyone thinks rosy cheeks are cute but when i hit my teenage years i wanted to do everything i could to cover it up. I have always struggled to find products to conceal the redness as its makes my skin tone look uneven and makes me quite self conscious. It is a fact that creams containing yellow or green are the best at covering up redness and I had previously tried one by benefit which was a yellow stick/concealer but they no longer stock it and i cant remember the name oops, but it didn’t work at all for me and putting foundation on top just made it look cakey. 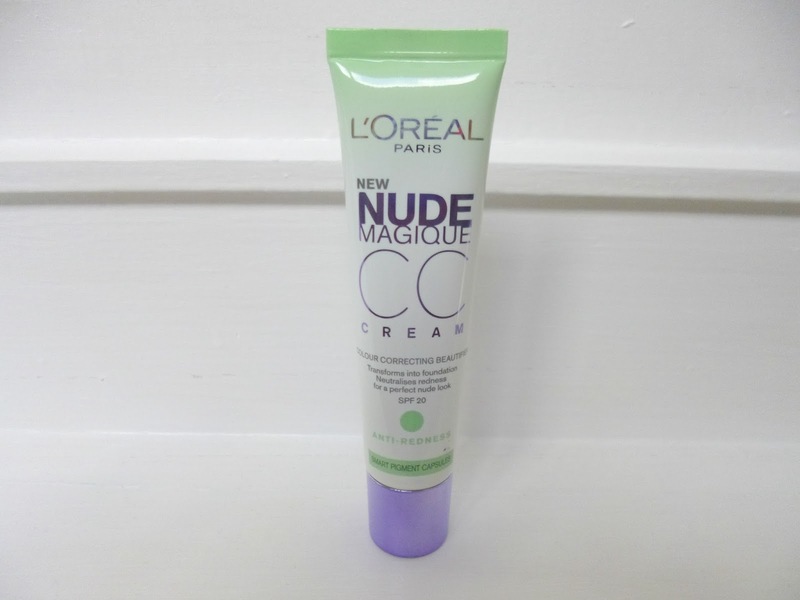 So when the release of Loreal Paris’s anti-redness cc cream came along i had to give it a try. The CC cream is a colour correcting cream which acts to combat any redness,it is of a liquid consistency just like foundation but without the thickness of it,it comes out green but when rubbed into your skin it blends and matches to your unique skin colour or so it says. The coverage is quite thin and it recommends applying foundation on top or another layer of the cc cream if you want any added coverage. I have tried all 3 ways of wearing it and here is my verdict. I have lived in the cc cream this summer as i have had a tan so i haven’t needed as much coverage, firstly it does not fully cover my red cheeks which disappointed me,however it did even out my skin tone slightly. I would fully recommend using this is you suffer from spots as it completely covers up that unsightly redness you get with them, so i would use this as almost a concealer on the spots underneath my foundation and it really helps to make your skin look flawless. I also applied 2 layers of this to see the difference and this time it really helped the redness fade,however it made me look orange,seeing as it is meant to match to your skin tone it really put me off using it again because it made my skin look unnatural (towie esque),the same happened when i also applied foundation over the top of one layer of the cc cream. Because the cc cream is a universal shade i definitely wouldn’t recommend it to people with pale skin as it will be more than likely too dark for your skin tone. Although, I will be repurchasing this again and as the winter months approach i will be using this on just the patches that need it with foundation over the top, as it is great for evening out skin tone and covering up spot redness. But for me i am still on the search for the elusive product to conceal my redness!! Do you have any suggestions? Have you tried any cc creams?